Given the general excellence, so far, of the Osmo Vänskä complete Sibelius series on BIS, it is tempting to say that this latest instalment is virtually self-recommending. Indeed, the very first play-through confirmed that recorded sound, committed orchestral playing, a generous and well-planned programme and superb notes and presentation, kept things well up to scratch. Further acquaintance revealed more riches, as one realised how well shaped and intelligent are Vänskä�s interpretations of some very familiar and oft-recorded repertoire. A spacious and deeply felt performance of En Saga opens the disc. My old college tutor, the late and much missed Harold Truscott, used to refer to this piece as containing, in embryo, just about every Sibelius �thumbprint�, all the unique qualities and originality that would distinguish his later music. As usual, he was absolutely right, and I think he would have enjoyed this performance. Vänskä�s pacing seems to me virtually ideal, letting the phrases and paragraphs unfold in a natural and unforced way. I have always rated Ashkenazy�s Decca performance of this work (on an excellent compilation from his classic 80s Sibelius series), but Vänskä probes that bit deeper. Having said that, the playing of the Philharmonia, who always responded to Ashkenazy, is definitely superior; in fact, it�s absolutely world-class. But the Lahti band do their conductor proud, and what may be missing in refinement is more than made up for in enthusiasm and characterisation. If En Saga is one of the composer�s longest symphonic poems, the next two on the disc are among the shortest and possibly least well known. The Dryad was completed in 1910, while Sibelius was working on the Fourth Symphony, and its sparse textures and enigmatic melodic material seem to betray its proximity to that towering masterpiece. It is an atmospheric piece with hints, in places, of the impressionism of Debussy. The Dryad�s Op. 45 companion piece is the brief Dance-Intermezzo, an excellent example of Sibelius in lighter mood. The Lahti players clearly enjoy themselves, and the extrovert orchestration is well realised. The rest of the disc is given over to four mainstays of the Sibelius repertoire, every one full of the brooding atmosphere and awesome majesty that is so much a part of his mature music. Pohjola�s Daughter, originally called Väinämoinen or L�aventure d�un héros � an evident allusion to Strauss�s Ein Heldenleben, which Sibelius had heard under the composer�s baton in Berlin in 1905 � is given a vital and beautifully shaped reading. Here the orchestra really do excel themselves, and the excitement Vänskä whips up in the central episode (around 8.55) is thrilling. 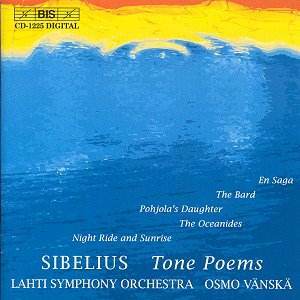 Night Ride and Sunrise, one of Sibelius�s greatest inspirations, finds Vänskä and his forces again on top form, with a real feeling for the architecture of the work. Again his pacing is steady, though there is an inevitability about the momentum that eschew surface excitement in favour of a gradual nobility. One can sense, in this performance, Sibelius�s words regarding this piece "�I was concerned with the inner experiences of an average man riding solitary through the forest gloom; sometimes glad to be alone with nature; occasionally awe-stricken by the stillness or the strange sounds which break it; but thankful and rejoicing in the daybreak"
The Bard and The Oceanides date from around the same time, and, in Robert Layton�s words, are " vintage Sibelius, the composer at his most powerful and poetic". Even the famously dismissive New York critic Olin Downes was moved to refer to The Oceanides as "the finest evocation of the sea which has ever been produced in music". Whether you agree with such a sweeping statement or not, this is just as evocative as La Mer; indeed, its orchestral tapestry and sound-world are, again, not a million miles from that of impressionism, something which has not gone unnoticed by Vänskä. His pacing and attention to detail in both works is exemplary, and I can�t imagine either piece being brought off more convincingly. So, as a collection of major Sibelius tone poems, this makes excellent sense for any collector. You may well have alternatives (including BIS�s own rival series from Järvi), but Vänskä is keeping up to the incredibly high standards he has set himself. I guarantee you will have no cause for complaint.